China had 1,043 cases of occupational exposure to HIV last year, although none resulted in an infection, according to Chinese experts. She said the center has been working on a plan on how to assess and compensate for occupational exposure to HIV, ever since Premier Wen Jiabao suggested the country should add exposure to blood-borne viruses to the list of occupational diseases as soon as possible. A surgeon in Beijing, who did not want to be identified, said he would prefer that guidance on post-exposure response was posted in operating rooms for every surgeon to see, as well as specific standards for when preventive medicines cause serious side effects or fail to work. He emphasized that such standards are not just for dealing with operations on HIV carriers. But people with other conditions, such as SARS, hepatitis and tuberculosis. 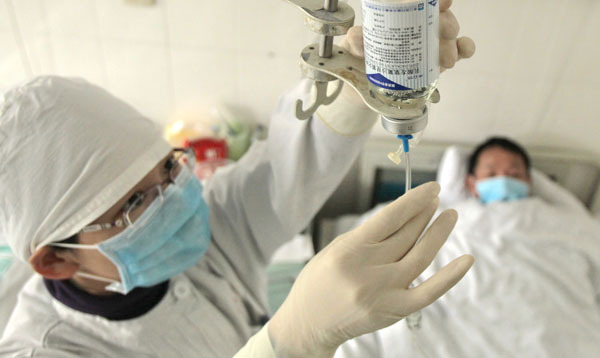 However, regardless of the type of virus, Fu Yan, a head nurse at Beijing You’an Hospital, which provides anti-viral treatment for HIV, insisted that universal precautions are needed to prevent medics from being exposed to patients’ blood and other bodily fluids. “The emergency response and compensation guidance show that government cares,” she said, “but taking precautions is the most important thing.